"The hero Andalib Takatka... carried out a Martyrdom-seeking operation in Jerusalem in which 6 Zionists were killed, and dozens injured"
“Don’t tell it - show it,” is a golden rule in marketing. With that in mind, you could say PA Chairman Abbas has a funny way of showing it. While Abbas recently proclaimed to Israeli TV viewers that he “extends his hand in peace” to Israelis, his own Fatah movement raises its hands in honor of suicide bombers who have killed Israelis. “Glory and eternity to our righteous Martyrs"
Andalib Takatka detonated her suicide bomb on Jaffa Road in Jerusalem on April 12, 2002, killing 6 and wounding more than 80. 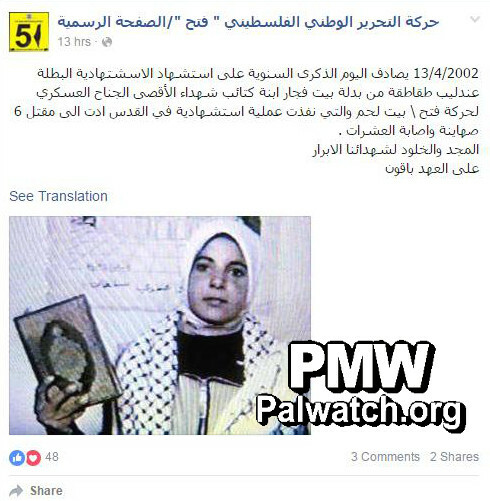 Ayyat Al-Akhras was the youngest female Palestinian suicide bomber (aged 17) and detonated her bomb near a Jerusalem supermarket on March 29, 2002, killing 2 and wounding 28. 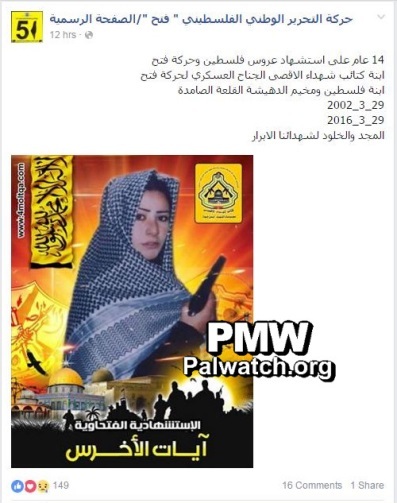 Posted text: “April 13, 2002 - today is the anniversary of the death as a Martyr (Shahida) of the Martyrdom-seeker (Istish'hadiya), the hero Andalib Takatka from the town of Beit Fajjar, daughter of the Al-Aqsa Martyrs’ Brigades - Fatah’s military wing - in Bethlehem, who carried out a Martyrdom-seeking operation in Jerusalem in which 6 Zionists were killed, and dozens injured. Glory and eternity to our righteous Martyrs"